Hope will not be eating ice cream after her tonsils are removed. A visit to the specialty veterinarian today did not provide definite answers for Hope’s problem. We are working with a surgical oncologist, who took his time and explained everything well. X-rays of her lungs were good. An ultrasound of her abdomen found an enlarged lymph node outside her colon. A needle aspiration, which this vet urged to be done quickly because I was so distressed, did not give us a concrete answer about cancer. Hope is still snoring like a chainsaw and in some discomfort; we will have her tonsils removed tomorrow morning, March 18. The tissue will get a biopsy. In addition, we will have a CT scan of her head and her nasal passages scoped. Given all that, we should know something definite. Hope will spend the night in the hospital, which has round-the-clock care. We hope to bring her home Saturday. 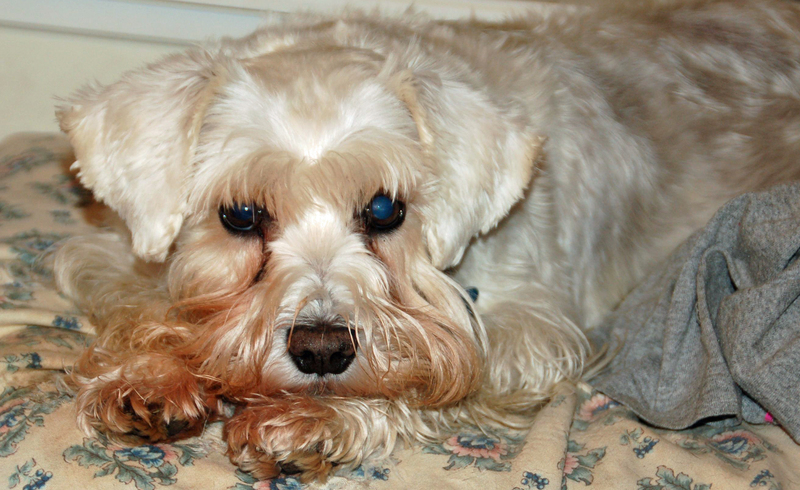 This entry was posted in Dog Health, Puppy Mills, Schnauzers and tagged dog health, puppy mills, Schnauzers. Bookmark the permalink. Although I haven’t seen you since you were adopted, I still think of you often. I’m so glad you got your happily-ever-after. I’ll never be able to count the number of dogs I’ve known in my life. Once in a while a special dog comes along that never really leaves your heart. You are one of those special dogs. I just heard about your cancer scare. I will keep you and your family in my prayers. Mendi–are you the woman who first rescued her? Please know she is loved. Many prayers are being said for your little Hope. There is a prayer chain that as started across the countryfor Hope..hugs to all.